Leah Howland is a survivor. And a deserter. After three numbing years, she has forsaken her husband and escaped to mythical Ireland where a stalker leaves her calling cards that are eerie and increasingly gruesome. Shadowed by the legend of the warrior hero Cúchulainn and preyed upon by her own escalating imagination, Leah finds her escape is turning into a virtual prison of chilling mind-games and cold-hearted crimes. "Extraordinarily well-crafted and engrossing, The Silver Tattoo is both a thrill ride and a darkly beautiful vision of modern Ireland. This deeply atmospheric novel will linger long after you finish reading." "A stolen bottle of nail polish and a butterfly (ancient symbol for the soul) are paired in a childish prank that is transformed in The Silver Tattoo, page y suspenseful page, into a nerve-shattering drama that catches the reader up in a much older drama, a play of shadows cast by warriors and queens of Irish myth." 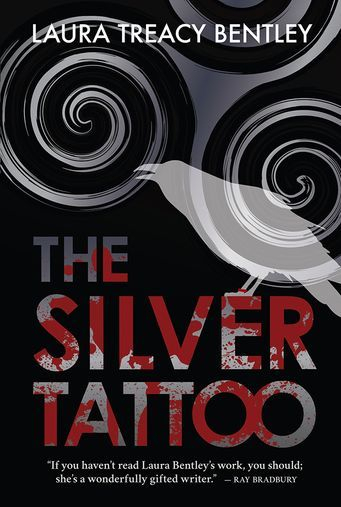 The Silver Tattoo is also available at Empire Books and The Red Caboose in Huntington, West Virginia.